This is our professional metal detector which can be used to locate valuable metal such as silver and gold from iron relics, coins and household Items. It is the perfect search engine on the beach, old castles, old battlegrounds, forests etc. When metal is detected, there will be some noise and the LCD display would show the probable type of metal, the depth of the target etc. This item also features with a headphone for clearer listening. Don't hesitate to buy one to begin your metal-detecting trip! 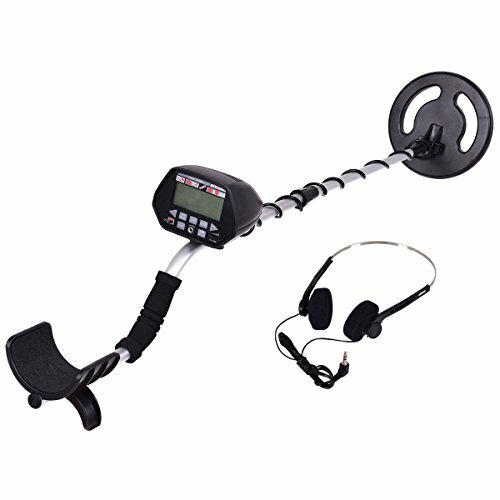 Metals smaller than US 25cents could only be detected in the distance of 4"
LCD display dimension: 4" x 5"
【All-Metal Mode and Disc Mode】This metal detector has two modes to choose, one is all-metal mode and the other is disc mode. All-metal mode for detecting metals widely, discrimination mode for detecting high purity metals and eliminates most unwanted metals. It sounds distinctive tones for different types of metal. 【Waterproof Search Coil】The search coil is waterproof, it can work in rain. The meter pointer on display swings to the right if metal is found. 【Headphones Included】Package includes headphones, which help anti-interference in outside. Volume level of speaker and headphone are adjustable. 【Ergonomic Handrail】Comfortable handrail adopts ergonomic design, it reduces feelings of fatigue when you work with it. Length of stem can be adjusted from 41" to 48". 【LCD Display】The LCD display shows the probable type of metal with an arrow, the depth of the target, DISC/NOTCH range, the level of SENS with segment, the operating mode, and low battery indication.